Meteorites strike most of the world blind. An exception is Bill Masen, an American seaman recovering from an eye operation in London, who rips off his bandages and leaves the deserted hospital to find a city of gropers. In a Cornish lighthouse are two other exceptions- Tom Goodwin, marine biologist, and his young wife, Karen. They hear of the disaster by radio and also learn that outer space has showered earth with the seeds of trill ids, fast-growing giant man-killing plants that walk. Masen rescues a fourth exception, Susan, a schoolgirl, first from a blind brute, then from a trill id. He commandeers a launch, they cross the channel and join Christine Durrant, Professor Coker, and his sister, who have also escaped blindness. Christine has turned her chateau into a hospital for victims. 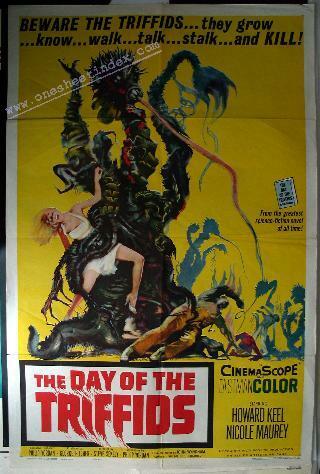 A triffid kills Coker and the chateau is taken over by escaped prisoners who can see. of triffidsobreaks in, slaughtering, but Masen rescues Christine and Susan and they head for the Spanish naval base at Alicante while, at the lighthouse, Goodwin fights off a triffid with a 'harpoon and apparently kills it. He performs an "autopsy" to learn its nature, and begins to experiment for a triffid poison. Every test proves negative. Masen and his charges stop at the Spanish farmhouse of blinded Luis de Ia Vega and his lovely wife, Teresa. Christine delivers the woman's baby as Masen, using a gasoline-truck 'hose as a flame thrower, fights of I another trill id host. Discovering it is sound that attracts the monsters, he drives of f in a circus van with the music playing, leading a grisly parade of the killers, and permitting Christine, Susan, and the Spaniards to escape in another car. In the lighthouse, as the Goodwins sleep, their "dead" trif lid comes back to life and begins to climb the steps in search of them. Wakened by Karen's scream, Tom turns the fire hose on the invader-and sees it dissolve before his eyes. He has found the answer that will save what is left of civilization-common sea water. Meanwhile, Masen and the others have reached Alicante and are picked up by a submarine to be taken to a rescue base. From the Novel ................. "The Day of the Triffids"